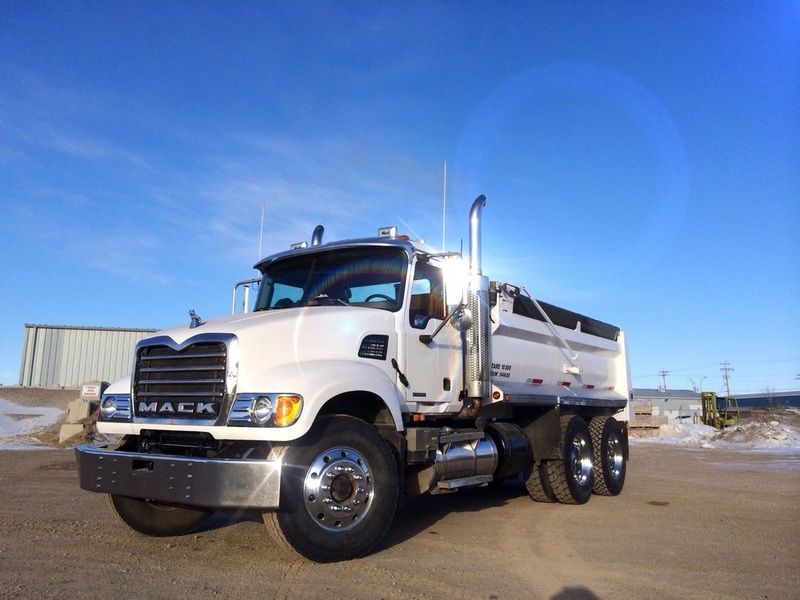 Operating for three generations, Greg McLean is current owner of this family owned business. Formed by Elmer Gray in 1947, and continued upon by son Harrison, Gray's Limited has been a staple for heavy equipment work and trucking in Strathmore and surrounding areas for 65 years. "Quality trucking and excavating since 1947"
Gray's Limited provides a variety of excavating and trucking services, both residential and commercial, septic system and water/sewer installation. Gray's Limited operates mulitple gravel and clay pits in Wheatland County, and provides gravel, sand, topsoil and clay sales and trucking for the surrounding area. Hyhoe, Catwork, Bobcat and Backhoe Services. Truck and Tri-Axle Pups, Truck and Tri-Axle Enddump, and Truck and Quad-Axle Wagon Combinations. Available for pick up or delivery at our Strathmore location, weather depending. Please call for ordering, inquiries, hours and availabilty. Advance notice is required for delivery. Loading may be available for a nominal fee. Visa, MasterCard, AMEX, and Interac (Debit) accepted. 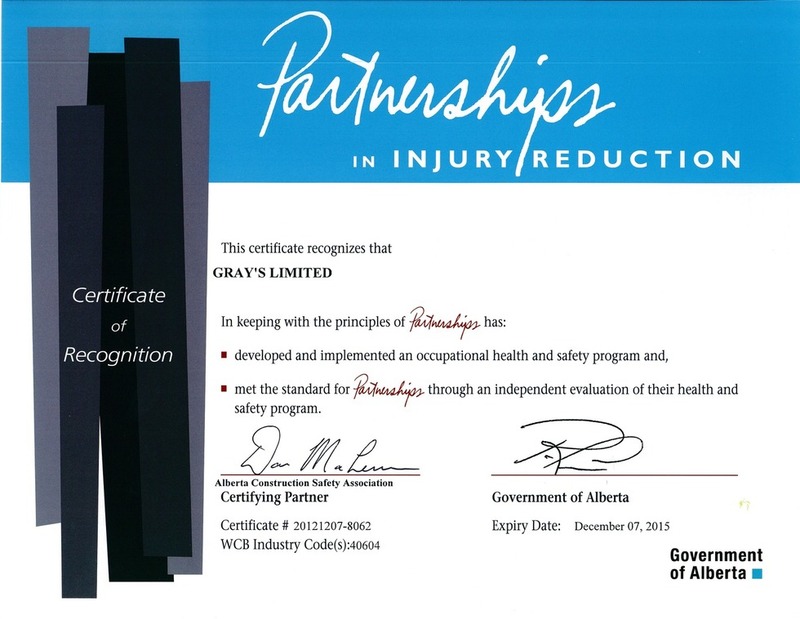 Gray's Limited is COR Certified, and a member in good standing of ISNetworld® and Complyworks®. 1998 Dynapac CA141D RT Smooth Drum 60"
1999 Dynapac CA141D Padfoot Packer 66"
Add 1/2"-3/4" of Topdressing Soil to an old or sparce lawn and then rake the soil through the blades of the grass. Adding seed to the new soil will help make your lawn more full. But don't add too much soil for it can smother the lawn, so keep it to a minimum. Why do I topdress my lawn? Topdressing your lawn is a great idea since it adds organic matter and nutrients to the soil to help strengthen the root system that supports the grass throughout the season. And when your lawn in more healthy and dense, it makes it more difficult for the weeds to grow. When do I topdress my lawn? The best time is in the spring and early fall when the days are warm with the sun and the evenings are cool. This will allow for optimal conditions for grass seed to grow. How do I topdress my lawn? 1. First of all, make sure your grass is actively growing. Remove all the dead grass from your lawn by thoroughly raking it. 2. Core aeration should be done every 2-3 years. Core aeration removes plugs of soil from the ground and leaves channels for air, water, and our Screened Topsoil to penetrate the surface. 3. Cut your lawn the day before you apply the soil. Then apply a few shovelfuls to a few square feet at a time. 4. Spread the topsoil using something flat, like the back side of a heavy garden rake, working it into aeration holes and covering low spots. Make sure the Topdressing Soil is no more than 1” deep (preferably ½” or less) over the existing grass. 5. Keep working the soil until your grass peeks through and the depth is even. 6. For small low spots that need a bit more Topdressing Soil, first remove the existing sod to prevent underground decay that can damage new grass seedlings. After filling in the low spot, either replace the old sod or re-seed the area. 7. Spread some grass seed over the areas that you want to make more full. 8. Water the area well. Gardens & flower beds: When adding to existing gardens and flower beds, 2"-3" is recommended. For increased effectiveness, blend the new soil in to the existing soil. When making a new garden or flower bed, a 6"-12" depth is recommended depending on the type of plants you will be planting. For seeding or sodding: For a new lawn, a good base of 4"-6" of screened topsoil is recommended. When redoing an old lawn perhaps only a 2"-3" new layer of screened topsoil is needed. Flower beds & gardens: Add 1"-2" of compost on top of flower beds or gardens and then blend the mushroom compost in to the existing soil. The mushroom compost is very high in nitrogen, so it is highly recommended to blend the mushroom compost in to the existing soil and to not leave it on top of the beds or allow it to rest against plants. For new flower beds: Apply 3" of mulch to prevent weed growth yet still allow water to access the soil. For older flower beds: Apply approximately 1" to refresh the mulch every year or alternating year, depending on the effectiveness of the mulch. Under sheds: A 4"-6" base using 7/8" clear stone. The other option is to use 7/8" crushed stone instead of 7/8" clear stone. When calculating depth, be sure to get full coverage. For example, go with a minimum depth of 2" for the sizes 3/8"-5/8" and 7/8"-1". For the 1 1/2" size Rock, go with a depth of 3". And for 2"-5", we recommend calculating at a 7" depth. It is also recommended to add a weed barrier or GeoTextile first before placing the Rock to ensure weeds are restricted. Stone walkways: If you're thinking of using the 16mm Pea Gravel, the smaller sized stone may provide more of a sugary feel under your feet. However, if you want to place outdoor patio furniture on the stone, the smaller size will allow the outdoor patio furniture to slide in to the stone. Where as the 40mm Pea Gravel can provide a more stable feel under the feet but it may not be as effective with outdoor patio furniture. For the 1"-4" Drainage Rock, we recommend calculating depth at a minimum of 5" for full coverage. Under patio stones and interlocking: Add 4"-6" of 3/4" crushed gravel for a base and then compact it with a hand or machine tamper. What is more beneficial is compacting the crushed gravel in lifts, which means that you would add 2"-3" of 3/4" crushed gravel and then compact it. Then add the next 2"-3" layer of 3/4" crushed gravel and compact it. This will allow for increased compaction. Then add a 1"-2" layer of stone dust for levelling purposes for the patio stones or interlocking. The other option is to use 1"-2" of 5mm washed sand instead of screened sand since the concrete sand does not compact, allows for easier levelling, and provides good drainage. Driveways: Top up old driveways with 3/4" crushed gravel which provides structure and compacts. Pathways: Use 3/4" crushed gravel to create a sturdy path. Under sheds: A 4"-6" base of 3/4" crushed gravel compacted with a hand or machine tamper. The other option is to use 3/4"-1.5" rock instead of 3/4" crushed stone. But first, refer to installation instructions for your shed. Under hot tub pads: A 4"-6" base of 3/4" crush is recommended. What is more beneficial is compacting the gravel in lifts, which means that you would add 2"-3" of gravel and then compact it. Then add the next 2"-3" layer of gravel and compact it. This will allow for increased compaction. But first, refer to installation instructions for your hot tub. Under sheds: A 4"-6" base using 3/4" rock. The other option is to use 3/4" crushed gravel instead of 3/4" rock. Used under pool liners: A 4" base of washed sand provides a smooth surface for the pool liner to rest on. Under patio stones & interlocking: Add 4"-6" of 3/4" crushed gravel for a base and then compact it with a hand or machine tamper. What is more beneficial is compacting the gravel in lifts, which means that you would add a 2"-3" layer of 3/4" crushed gravel and then compact it. Then add the next 2"-3" layer of 3/4"" crushed gravel and compact it. This will allow for increased compaction. Then add a 1"-2" layer of 5mm washed sand for levelling purposes. The concrete sand does not compact, allows for easier levelling, and provides good drainage. The other option is to add a 1"-2" layer of 3mm washed sand. The recommended depth for a safe playground is 12" of 16mm Pea Gravel or 7mm Gyra Rock. Gyra Rock is a chip product made to City of Calgary spec for playgrounds. Dog Runs: A 6" base using 16mm Pea Gravel will be suitable for small dogs. The other option is to use 40mm Pea Gravel instead of 16mm Pea Gravel will prevent some pebble tracking issues that is a possiblity with larger dogs. First of all, what is mulch? Wood mulches are derived from debarking cut trees. The stripped bark is processed through a grinder and shredded. Due to the variability of the tree types, bark mulches fluctuate, each having their own individual effect. Some mulches provide the soil with nutrients, slowly releasing the nutrients as the mulch decomposes. When applying mulch, we recommend a total depth of 3" which will allow all the benefits of restricting weed growth, yet still allow water to access the soil. Mulch prevent loss of water from the soil by evaporation. Mulch reduces the growth of weeds, when applied deeply enough to prevent weed germination or to smother existing weeds. Mulch keeps the soil cooler in the summer and warmer in the winter, thus maintaining a more even soil temperature. Mulch prevents soil splashing, which not only stops erosion but also keeps soil-borne diseases from splashing up onto the plants. Mulch can improve the soil structure. As the mulch decays, the material becomes topsoil. Decaying mulch also adds nutrients to the soil. Mulch prevents crusting of the soil surface, thus improving the absorption and movement of water into the soil. Mulch prevents the trunks of trees and shrubs from damage by lawn equipment. Mulch helps prevent soil compaction. Mulch can add to the beauty of the landscape by providing a cover of uniform color and interesting texture to the surface. You can also do this using the Volume Calculator link on the first page! What is the conversion from cubic yard to metric tonne?